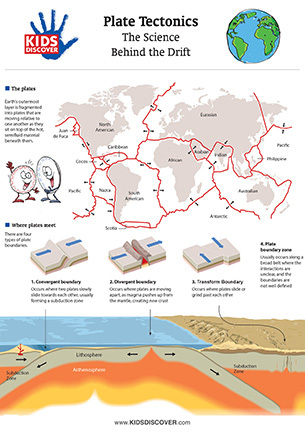 Illustrate the concept of plate tectonics for kids with this detailed full-color infographic from KIDS DISCOVER. Login or Sign Up for a Free Account to access this content. In order to access free content on Kids Discover Online you must either login to your existing account or sign up for a free account and login.